Today, Purdue Extension delivers practical, research-based information that transforms lives and livelihoods. Tailored to the needs of Indiana, its current programs include Agriculture and Natural Resources, Health and Human Sciences, Economic and Community Development, and 4-H Youth Development. However, today’s success is built on over a century of visionary hard work and outreach. Scattering the Seeds of Knowledge: The Words and Works of Indiana’s Pioneer County Extension Agents chronicles the tales of the first county Extension agents, from 1912 to 1939. Their story brings readers back to a day when Extension was little more than words on paper, when county agents traveled the muddy back roads, stopping at each farm, introducing themselves to the farmer and his family. These Extension women and men had great confidence in the research and the best practices they represented, and a commanding knowledge of the inner workings of farms and rural residents. Most importantly, however, they had a knack with people. In many cases they were given the cold shoulder at first by the farmers they were sent to help. 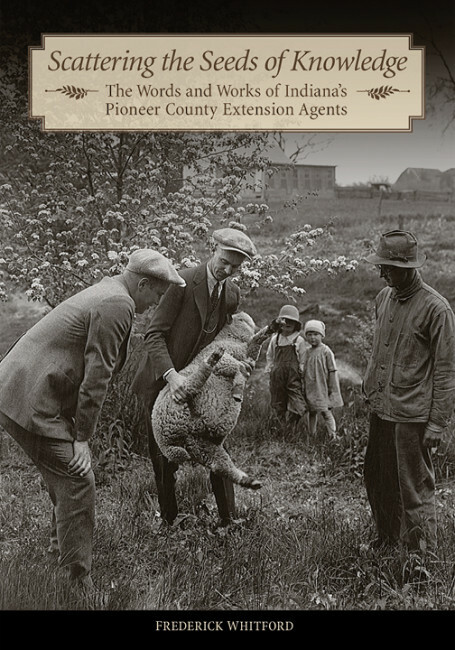 However, through old-fashioned, can-do perseverance and a dogged determination to make a difference in the lives of people, these county Extension agents slowly inched the state forward one farmer at a time. Their story is a history lesson on what agriculture was like at the turn of the twentieth century, and a lesson to us all about how patient outreach and dedicated engagement—backed by proven science from university research—reshaped and modernized Indiana agriculture.